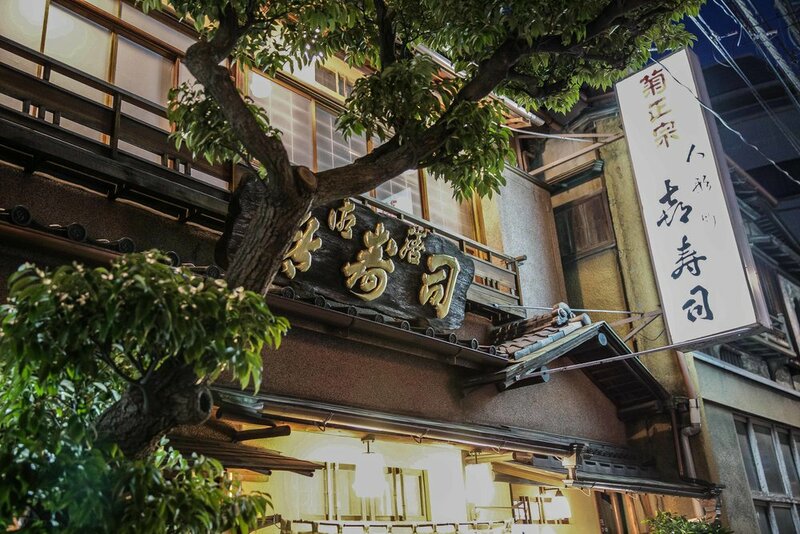 Ningyocho is one of those great Tokyo neighborhoods where the Edo vibe can still be felt, with old houses, shops, and restaurants that date back to the period. It is located in Nihonbashi and was part of "Shitamachi" - Edo's downtown. 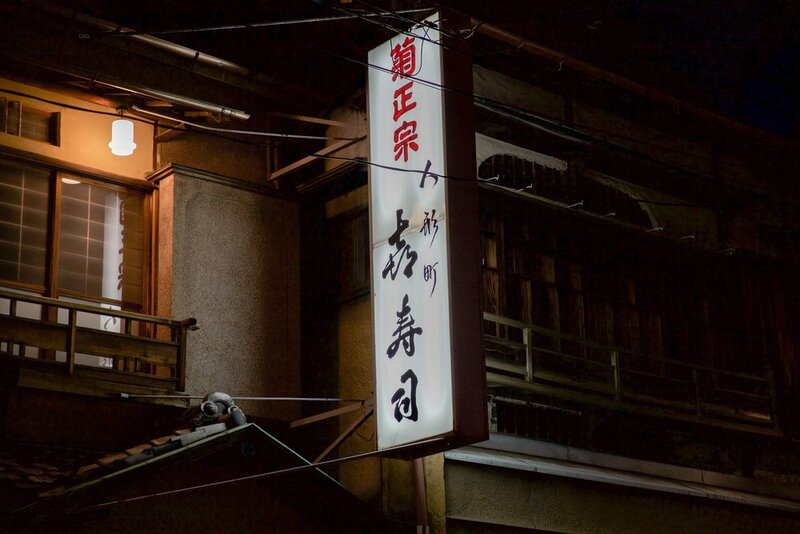 The famous "Amazake Yokocho" street, with its nostalgic Edo stylings, is in Ningyocho. And there are of course some great sushiya in the area, including the famous Kizushi. Ryuichi Yui was born in 1942 and is the third generation master of Kizushi, which has been in business continuously since 1924. He's assisted by his first and second sons, Kazuhiro and Koji. The elder son will one day take over the business and become the 4th generation master. The shop, as you can see from the photos, is as "old school" as it gets. The building itself is well over 60 years old, it was built in 1952 by the current owner's parents. Nothing much has changed since then, except for the newer glass doors and the refrigerated sushi cases. Stepping inside this sushiya is like stepping back in time. I arrived in Tokyo last week and Kizushi was my first dining stop. I flew in to Narita, took the Narita Express to Shinjuku, checked in at my hotel, showered, changed, and headed straight to Ningyocho to meet friends for dinner. Indeed, I'd been looking forward to eating here since Chef Akira Yoshizumi recommended the restaurant to me as a prime example of authentic Edomae-zushi. We were warmly welcomed into the restaurant upon arriving at 7:30 sharp. The vibe inside the restaurant was fantastic... the bar was completely filled with locals only - very Edokko! As you will notice, I elected not to take any photographs inside the shop (except for a couple quick iPhone shots...) - whippin' out the DSLR in this environment just didn't feel right, and I wanted to respect the regular customers and the chefs. A few options were available for dinner: a 10 piece "nigiri only" omakase for ¥10,000, a "sashimi + 10 nigiri" option for ¥12,000, and a couple other choices, the most expensive being priced at ¥18,000. We opted for the ¥12,000 per person course. For the sashimi course, we received delicious akagai, ika, and "early season" katsuo. The sashimi was outstanding. Our ten pieces of nigiri consisted of medai, akagai, aji (pictured below), kobashira, hotate, maguro zuke, chu toro, kohada, anago, and tamago. We were also served a tekkamaki at the end of the meal. I found the sushi to be of excellent quality. The nigiri pieces were slightly larger than usual (which I like), and the shari was really good: strongly seasoned with komezu, a little salty, and on the sour side. Very balanced and quite nice! The neta was of high quality throughout the meal, with the akagai, maguro zuke, kohada, and aji being particular highlights. Overall, an excellent first meal on this visit to Tokyo! I highly recommend Kizushi to anyone interested in true Edo style sushi. The chefs here stick to traditional Edomae style preparation techniques and source high quality neta. They are masters at their craft, there is no doubt about that. I do feel that the meal was a little bit on the expensive side, though, and next time I'm in Tokyo, I will elect to visit the shop during lunch, when the 10 piece nigiri set is a mere ¥3,000. Note that very little English is spoken, but the chefs and staff are all quite friendly and will do their best to accommodate foreign customers. Reservations are required at dinner time, while walk-ins are OK at lunch.